Not unlike European artists, who painted heavenly scenes on cathedral and palace frescos, ancient Chinese painted divine imagery on cave and temple murals. 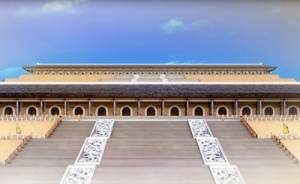 Buddhist traditions emphasize the golden yellow hue, while Daoist ones feature purple. The deities in the Buddhist and Daoist pantheon, like the majestic realms where they reside, have distinct and rich imagery. 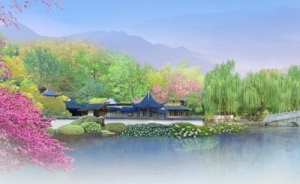 Shen Yun’s projection depicts these heavenly paradises in all their splendor. Seated atop a lotus flower, Buddha communicates through sacred hand gestures. He emanates compassionate warmth, bringing peace, joy, and reverence to his subjects throughout the golden world.